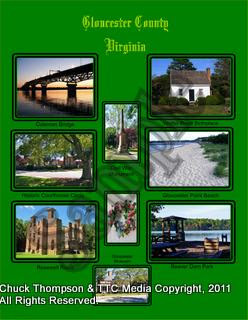 We have designed a new Gloucester County Print and have created a series of Postcards of Gloucester County. The print comes in various sizes from 8x10 matted and framed to 20x30 framed. These are actual photo lab prints for the larger sizes. The smaller sizes are being produced in one of our local studios. The postcards are a total of 20 different cards for series 1 also produced in one of local studios. No one has stepped up to the plate to create collectibles for travelers and tourists through Gloucester County on any major scale. So we decided to step up and fill that need. Tourists are looking for little things such as postcards or prints that reminds them of their trip through Gloucester. Postcards and prints gives them just what they are looking for. Plus we have developed an entire series of prints of hot spots from around the county that can be proudly displayed in any business or even sold at local businesses. We will soon be traveling throughout the county showing off these new items as well as items under development. These items foster customer loyalty, repeat business and word of mouth future business. Can we afford to turn our backs on that? Plus we can also custom create or assign from our own archives, specialty postcards and or prints. We are also developing a special art cards collection too. You can e-mail us at the bottom of this site if you would like to know about this sooner than we are able to find you in our travels.